“Teachers send us their wish lists for their classrooms. It could be for a specialized project, or it could simply be pencils and paper or crayons. The wish lists are published weekly in the Island Packet, and I keep them on record at the Chamber. Either somebody from the business community contacts me or I ‘dial for dollars’ with local businesses and say, ‘Hey there’s a teacher with this specific need.’” The local businesses then either donate the requested items or contribute funds to purchase them. “There are so many great things happening in our classrooms that teachers just need a little extra help with,” Horne said about Project Connect’s mission. Teachers and students alike are very appreciative. “When somebody comes in and grants their wish, it’s just like Santa’s come to town,” added Anne Feldman, Chamber communications manager, and your chance to play Santa is coming up at a Thursday, February 26 fundraising event, “Foodartica,” in support of Project Connect. Although Farris’s work explores a wide variety of subjects, he is best known for his joyously uplifting portrayals of South Carolina and Georgia Sea Island Gullah culture. Using bold, vibrant color and huge canvasses, his paintings seem to come to life before your eyes. If that’s not enough, the multi-faceted artist also plans to entertain with some of his original musical compositions—a blend of electronica and hip-hop—for this special occasion. “I try to create music with a positive message,” he said. In addition to creating his paintings and music, the Savannah College of Art and Design (SCAD)-educated Farris shares his artistic gift teaching studio art at University of South Carolina Beaufort and foundation art courses at SCAD. 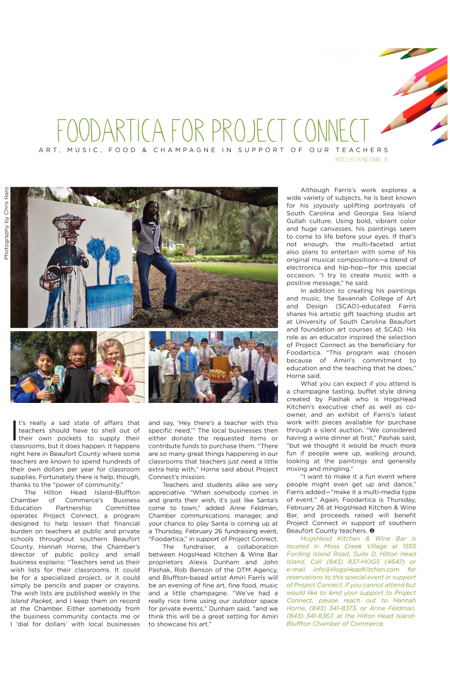 His role as an educator inspired the selection of Project Connect as the beneficiary for Foodartica. “This program was chosen because of Amiri’s commitment to education and the teaching that he does,” Horne said. What you can expect if you attend is a champagne tasting, buffet style dining created by Pashak who is HogsHead Kitchen’s executive chef as well as co-owner, and an exhibit of Farris’s latest work with pieces available for purchase through a silent auction. HogsHead Kitchen & Wine Bar is located in Moss Creek Village at 1555 Fording Island Road, Suite D, Hilton Head Island. Call (843) 837-HOGS (4647) or e-mail info@HogsHeadKitchen.com for reservations to this special event in support of Project Connect. 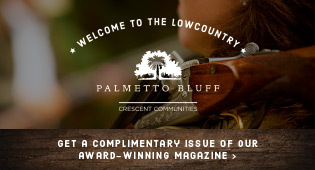 If you cannot attend but would like to lend your support to Project Connect, please reach out to Hannah Horne, (843) 341-8373, or Anne Feldman, (843) 341-8367, at the Hilton Head Island-Bluffton Chamber of Commerce.